A couple of people asked me about how I feel in regards to The CW cancelling Star-crossed. As with any TV programming topic I have a complex opinion about it and I tried to answer this with tweets and just couldn’t. But then I remembered I have a blog, precisely to post all my crazy ramblings on TV! Let’s start by talking a little bit about “bias”. People call my blogposts biased all the time, which I never really get. This is an “opinion” blog, I am not a journalist and I don’t claim to be “reporting without bias”. I will say one thing, I hate when people say “X show is so much better than Y, that’s why I’ve never seen an episode of Y”. It is impossible to compare two things unless you are equally familiar with both! So one thing I promise, I NEVER write comparisons about two TV shows unless I have seen every single episode of both and only then I write my opinion. An opinion which is probably “biased” by my personal tastes, preferences, experiences and personality in general. But that is what I do, write my opinion and I don’t think it is the law or universal, just mine. That’s why I MUST start by saying I have never watched an episode of Star-crossed. So my personal feelings on the subject are completely worthless. Therefore I’ll stick to explaining my opinion from a business point of view. There was a huge debate going online about BatB fans boycotting Star-Crossed and that there shouldn’t be a reason people couldn’t love both. Well, yes there shouldn’t… but there was. Unfortunately it was always going to be one or the other and here is why: The CW is owned by CBS and WB. The programs that air on the CW are produced by both parent studios. Reign (a CBS show was already renewed). All the other shows were produced by the WB. They were going to tolerate one low rated CBS show [to even the WB/CBS-produced ratio] but not more than one. I never thought both shows could get renewed and I always thought at least one would be saved. I am personally happy it was BatB rather than Star-crossed because I love that show, of course some people may feel the exact opposite; as they should if they were SC fans who never watched BatB! Even for people who watched and liked both, they had to like one more than the other… Anyway, as sad as it is… I do believe it was the only possible outcome. And I honestly feel bad for Star-crossed fans, because no-one understands LOVING a TV show and the fandom as much as I do. To quote Dan Harmon [after the cancellation of his show Community]: Fandom can become “almost religious, including the urge to stone the less than faithful”. They both SUCKED in the ratings: Beauty and the Beast had a 0.3 average Star-crossed had a 0.32 average [less episodes, slightly less competitive time-slot]. The difference is insignificant from a mathematical point of view, so it means nothing. SC didn’t have high enough ratings to give it an advantage over the other CBS shows. BatB had a couple of things that gave it an edge. 1) It already has 44 episodes. Syndication deals, international sales, online sales and all those money making deals are agreed upon a “per-episode fee”. So more eps=more money. Star-crossed only had 13 eps so far. 2) Beauty and the Beast does extremely well internationally. It is a hit in many countries and it has a recognizable brand that is easy to market. Finally 3) BatB has a cult-following. I think Star-crossed had cult hit potential. I really can’t comment on the strength of its fandom because I wasn’t a part of it, but for what I’ve seen the fans are very passionate about it. However, fandoms grow with time and Star-crossed just didn’t have the time to reach all of its potential viewers [and wasn’t airing in that many countries yet]. I don’t know if there were any fan campaigns for SC. I know BatB fans did everything from sending cake to M-Ped to raising $15,000 for the charity Austin Basis supports. I don’t think fan campaigns are solely responsible for saving a show and TV reporters looove to say fan campaigns are useless but I don’t think they are. I think they have an impact on the programmers, even if it is just something on the back of their minds. They certainly don’t hurt as part of the larger picture. In summary, I believe Beauty and the Beast was going to generate more money for the content owners than Star-Crossed. That is my educated guess, because I don’t have access to all the financial data of the studio. If you gave me the numbers I could build a cash flow, do some projections, calculate the Net Present Value and conclude which show equals more money. I think we can assume someone at The CW did just that and decided BatB was the most profitable option. It’s all business in the end. As for The Tomorrow People, Mark Pedowitz stated the following: "We have situations where shows like Beauty and the Beast have created upside potential... it's a fan favorite, it has a great international interest (...) The Tomorrow People was a great show... it just didn't have the same level of social engagement or digital side that Beauty and the Beast gets"
From that statement I get 1) Digital and social media are starting to matter 2) International dollars can make a difference. Mark's statement [which I read after writing this post] is pretty much in line with everything I've been saying. However, I think The Tomorrow People had to take it with The 100 rather than BatB due to the whole ownership thing (WB shows). Unlike Star-crossed I did watch The Tomorrow People and I quite liked it. But some shows had to go so I wasn't hoping for a renewal even though I liked it. It’s never fair! The way TV works is completely unfair. The fate of so many shows is decided by a handful of people and I get annoyed every year because shows don’t get the chance to find their audience. In an ideal world shows would never get cancelled before they get at least 2 seasons and creatively strong shows would be kept on the air until they find the audience they deserve! I was asked if I thought The CW mishandled Star-crossed and I think in a way they did. I don’t think marketing was the best [that is a common concern with CW shows] and it seems like The CW is always plotting to cancel the midseason shows before they even premiere! I think it was a surprise to EVERYONE that The 100 turned out to be a hit. And I think it was an accidental hit. It probably just caught the zeitgeist of the “teenagers surviving in the wild” trend. I believe The 100 is one of those shows that just premiered at the right time, just when that Hunger Games thing is “in”; which is exactly what happened with the post-Twilight TVD. If The 100 had premiered any other time, it probably would have failed. Or maybe people saw Henry Ian Cusick and what looked like an island and thought Lost? I really don’t know. Meanwhile Star-crossed was getting that “Roswell” inevitable comparison and that is just too outdated of a reference. It would be like someone pitching a Dawson’s Creek remake to teenagers of today… it wouldn’t mean anything to them. So yeah, in a way it is likely Star-crossed was doomed since the beginning or that the “odds were never in their favor” [Hunger Games pun intended]. You may also want to read "The Battle of the abs, when expectations and reality don't meet"
I watched both. 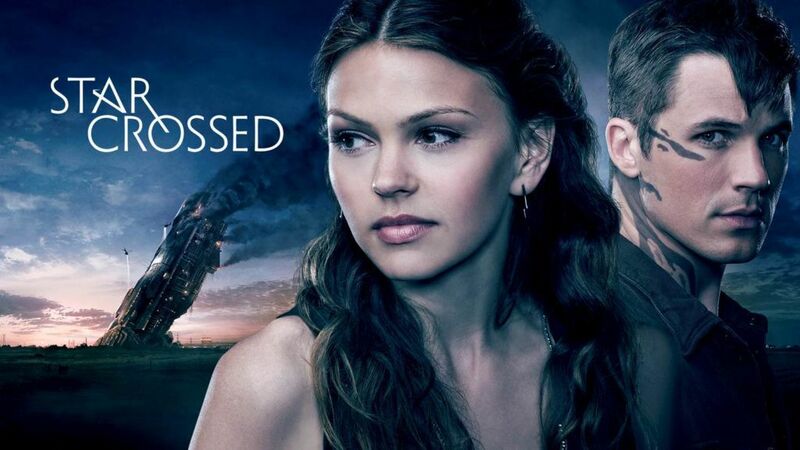 StarCrossed is infinetly the better show. CW got it wrong. Btw, clearly you didn't watch it or you would have realized StarCrossed had infinetly more competion in its timeslot. The Voice, The Blacklist, The Olympics, How I Met Your Mother Finale and Dancing with the Stars. Really? Those who sampled the show stayed. It's rating may have been low, but it kept the ones who started unlike BATB which lost 50% of it's fanbase due to horrible writing in the second season. It has an even bigger following in the international community than BATB already. CW is probably kicking itself right about now. No, I have not watched. Which is why I will not make any comments about the content and about which is the better show. I think it is perfectly acceptable for people to like one and others to like the other. I would never try to impose my preference on anyone, but I can't even have a preference because I haven't watched both. I wrote this [per request] just to analyze the potential revenue generating potential and why I think they made some of their programming decisions. If you have a theory as to why Star-crossed could have generated more money in the next five years (taking account all revenue streams and international distribution) I'd love to discuss it. I really don't see a way to come up with a future cash flow projection that is high enough to justify keeping it around instead of other shows, but there might be something I am not taking into consideration. Having said that, I would have kept SC on a million times before commissioning Jane the Virgin.